Exercise bikes are popular all over the world, whether in a gym or at home. There are different styles of bike (spin, upright, recumbent) and a variety of price ranges which come with different levels of comfort, reliability and different features. Today we’re looking at upright bikes, but not just any type of upright. No, today we’re focusing on shorter users and upright bikes which would suit them. If you just want a quick recommendation, I’d suggest you look at the Schwinn 130 Upright Bike. It’s reliable, solid and can handle users who are 4’10” or taller. There are some alternatives here if you’re shorter than that. Take a look through and see which bike suits your needs and has the features you’d prefer. 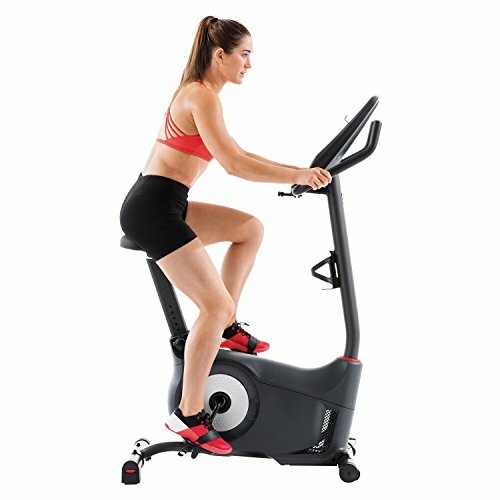 Remember we do plenty of reviews here at Gym Blazer, and if you’re interested in the best exercise bikes for short people, including every type of bike, then check out our post here. Alternatively, if you want an upright bike and are of an average or tall build, you might want to look at our guide to the best upright bikes. Now, let’s take a look at the bikes! The Schwinn 130 is a mid-range option with lots of features and plenty of reliability. Schwinn has a length history when it comes to bikes. Originally founded in 1895, Schwinn bicycles took less than a year to make an impact, clocking up more race wins in their first year than any of the other 300+ cycle companies in the United States. From there they tweaked their technology continuously, and stayed a top name in the bike industry. In the 1960’s they decided to take this knowledge and apply it to indoor bikes, allowing athletes to train effectively and comfortably. These days they also produce other cardio equipment, although their bikes are still one of Schwinn’s most popular products. 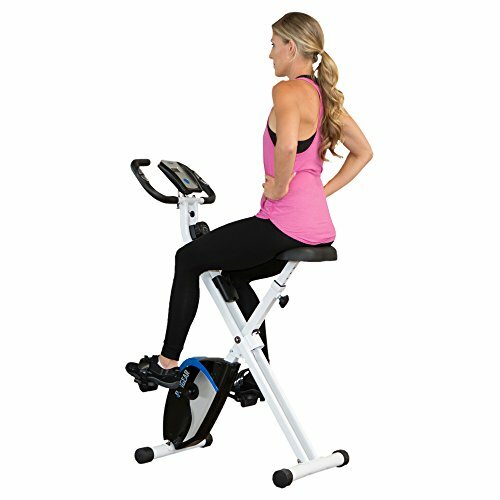 The Schwinn 130 Upright has a big range of movement for the seat to move through, so it can be used by different heights. It’s pretty easy to do this too, making it ideal if more than one person is going to use it. The handlebars are also adjustable which is important for shorter people because non-adjustable handlebars can leave you in an uncomfortable position. This bike can accommodate users from 5’ tall up to 6’1”, so it covers most common heights and shorter users – but isn’t good for tall users. With that said, it’s tough to find a bike that can adjust enough for a short person AND a tall person, with this one being able to fit taller users than most alternatives. The adjustments in two places also mean this is a comfortable bike for most users instead of just being one for shorter people. The movement of the handlebars can accommodate for build differences and give you a more comfortable position. 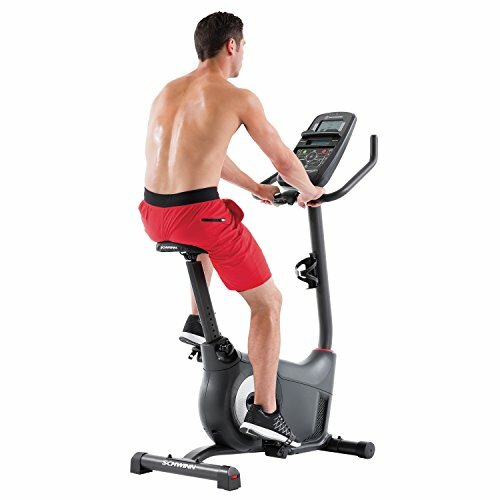 The Schwinn 130 comes with 20 resistance levels which is a lot of variation. At the top end even veteran cyclists are going to get a good workout, while the bottom end is easy enough for a complete beginner to get started without too much trouble. Having 20 levels means you can make jumps between levels smaller and easier to deal with, which is great for keeping your confidence and motivation high. There are 22 different workout programs available as well, so it’s not only resistance you can change up. The different workouts can be used to focus on improving different areas or to do different types of workout, such as intervals or hill work. Some of the workouts also track your heart rate and work based on that, so they’re tailored to your level of fitness. There’s enough here for you to change it up while sticking to the same goal as well, so using the bike stays interesting for you. Schwinn have fitted a few little extras to this bike, such as a USB port for charging/media use and a bottle holder to keep a drink handy. There’s a shelf for you to place a tablet on and forearm rests for the handles (which include heart rate monitors). There’s even a built in multi-speed fan to keep you cool and two screens of data from the built in console, giving you plenty of stats to view when cycling. To top it off, this bike comes with its own speakers built in as well – way more features than most other bikes at the same price! 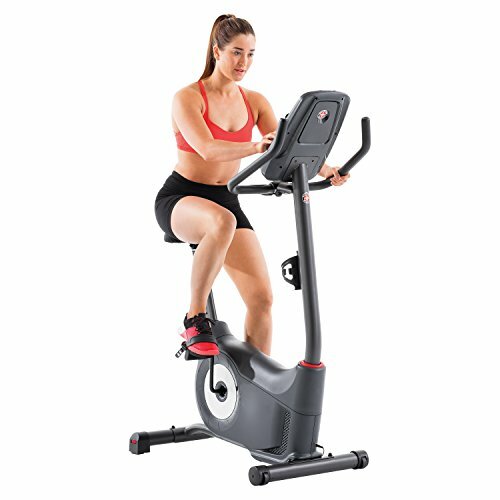 Warranty for the Schwinn 130 Upright Exercise Bike is solid, covering the frame (10 years), parts (2 years), electronics (1 year) and even the labor for a short time (90 days). It’s solid in most areas anyway, the warranty gives extra piece of mind though. We already covered the position being movable and comfortable for most users in the adjustability section. The handlebars themselves are also comfortable though, with a nice angle to keep wrists comfortable and a slender surface to grip. The seat is also a little bigger than standard bike saddles and is covered with a soft foam. It’s not a luxurious seat but it’s better than a hard plastic saddle. The bike stays quiet when in use as well. The pedals go through their motion smoothly and without causing any noise or vibration. They’re counterbalanced too so they start to slow naturally if you stop pedalling, and switching resistance is quiet as well because this bike uses a magnetic resistance system. Now you’ll remember I said this bike is reliable, and it is. There is a weak point though, and that’s the pedals. These can break quite easily but Schwinn is pretty good at sending out replacements, especially since they know this is an issue on the 130. Get in touch with them if you have any problems, and they should help you out pretty fast. Speaking of fast, one part which isn’t fast is assembling this bike. It can take over an hour to put together and is best done in pairs, though it would be possible to do solo if you have a little DIY experience. ProGear aren’t as well-known as Schwinn but they’re gaining recognition already for creating cheap, reliable home gym equipment. Their models aren’t as fancy or reliable as commercial grade equipment but they provide a good starting point for home exercisers. 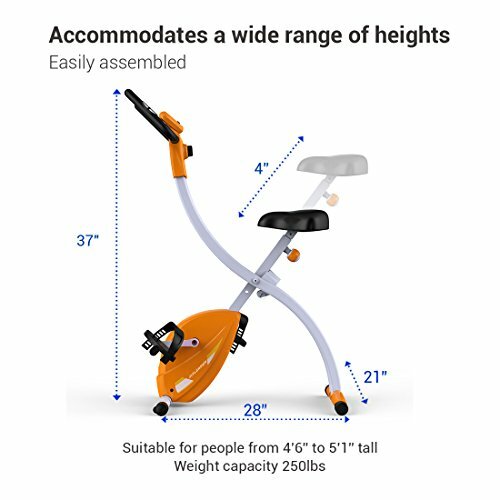 Their 225 Foldable Upright bike is a great choice for your first upright bike, especially for shorter users. The biggest pro for this bike is how little the ProGear 225 costs. It’s a real budget option making it an ideal first bike for newcomers. The low cost also makes it easily replaceable if you decide to upgrade or if something does happen to go wrong. Once folded the bike only measures 19”x17.5”x53” and weighs around 35 lbs. This is very small and light yet it still has wheels attached to make movement even easier. You could just fold this up and put it in a cupboard when not needed. Even when unfolded and ready for use, it doesn’t take up a massive amount of room so you don’t NEED to put it away if space is tight. Pedals move smoothly thanks to their 3 piece crank system and despite being a little louder than a magnetic system, it’s still pretty quiet. The pedals themselves are big and easy to push against, made from a solid material too. The seat on the 225 is also oversized and quite comfortable. 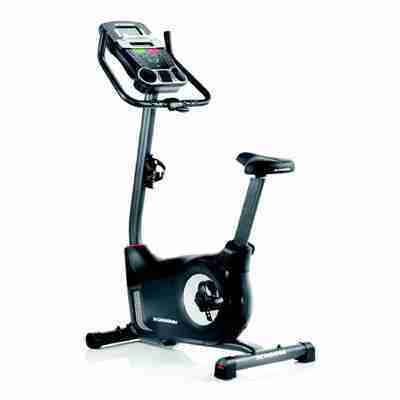 ProGear’s 225 Upright Bike only gives feedback on time, speed, distance, calories and pulse. The pulse monitor is the only extra too, as there isn’t a tablet holder/shelf or bottle holder. A budget bike is better off trimming these extras and focusing on quality anyway though. The screen also only displays one stat at a time. With only 8 levels covering the entire resistance range, you may need to make larger jumps than you’d like to. If you want a good workout it’s quite likely you’re going to be stuck at the same range of 2-4 levels for a while which can feel demotivating. There also aren’t any programmed workouts so you have to figure out your own session, which again limits your options and variety (for most people). The max weight for this bike is 220 lbs, not especially heavy. The height range recommended is 5’ – 6’, pretty standard and favoring shorter users instead of taller ones. Fitleader are a newer brand, having been around for only a few years. Most new brands struggle to make an impact. The mistake of offering cheap, low quality products is often their downfall. 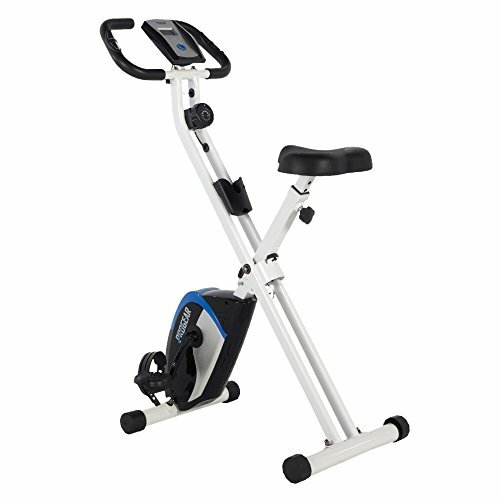 The Fitleader FX2 Upright Bike is different though, it has respectable build quality and sticks to the basics, making it reliable if a little boring. The difference between this bike and others is that it is targeted at shorter users – going as low as 4’6”! Having a small size and an adjustable seat makes this perfect for small users. It supports users up to 250lbs in weight though the height restrictions say this bike works for heights of 4’6” – 5’1”. This is designed for teenagers and short users. If you’re over 5’ it can be a little awkward to use, and over 5’3” it becomes practically unusable. The price for the FX2 is also low, which would be expected from a new company aiming at the lower end of the market. FitLeaders FX2 measures 35”x22”x52” and can be folded up so it takes even less space. Weighing around 50 lbs and equipped with wheels, it’s easy to move. The display is fairly basic, limited to calories, time, distance and pulse. There are no other options and the display console is very basic. Some people have pointed out the FitLeader FX2 Upright Folding Bike has very simple handlebars. They’re straight, hard and not very big. Some might find them a little uncomfortable. Wearing a pair of light, comfortable gloves can be helpful. The small size and lack of adjustability is a bigger problem though. As you can see, your choice will depends on your needs. 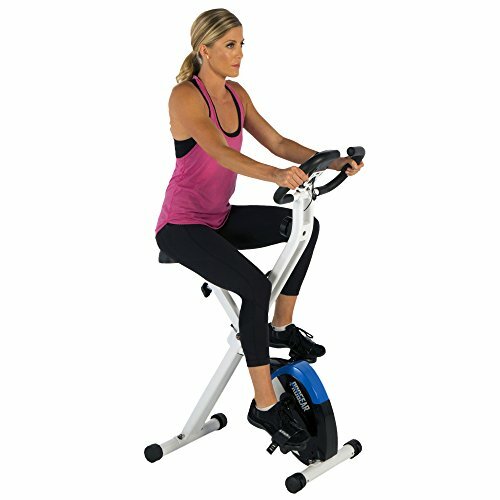 Users under 5’ tall are best off with the Fitleader FX2 but anybody taller should go for the Schwinn 130 – as long as you can afford it!